You offer politics, not science or fact. Invest in the Northwest passage, it will cut 3500 miles off of going south through the Panama canal. Good for industrial shipping from Asia to Western Europe. China will come on line with oil and gas production from the South China Sea and we will lose the Japanese market for our Alaska oil tankers. We have lost the southwest to Mexicans and they are now losing it to Central American caravans. It is now the Chinese century. the public's access to facts. that the temps have been sub O C every day over the bay. and soaring through the 2000s average soon. Let's just say that this is like a new sport; watching the ice form. They should be betting on it in Vegas. Diamond Dave lays it all out for us. pushing through the multi-decadal highs. The warmists' heads are spinning. the seas are located that are so important to biologists and climatologists. The Beaufort Sea is sub-zero F.!!! The ice formation this year is going to be epic! With another ~110 days until max. formation is reached. The total annihilation of the atmosphere will have the space kelvins of cold freeze us to death in the dark months and cook us to death in the light months. Get it? Please, try to get it cause it's going to get worse. If there be magic, let it be an art. Total annihilation of the atmosphere? It's not in good shape, but you wont get the satelite pics to prove it. Are you saying CO2 will destroy the atmosphere? It would be grand if CO2 was our only pollutant. 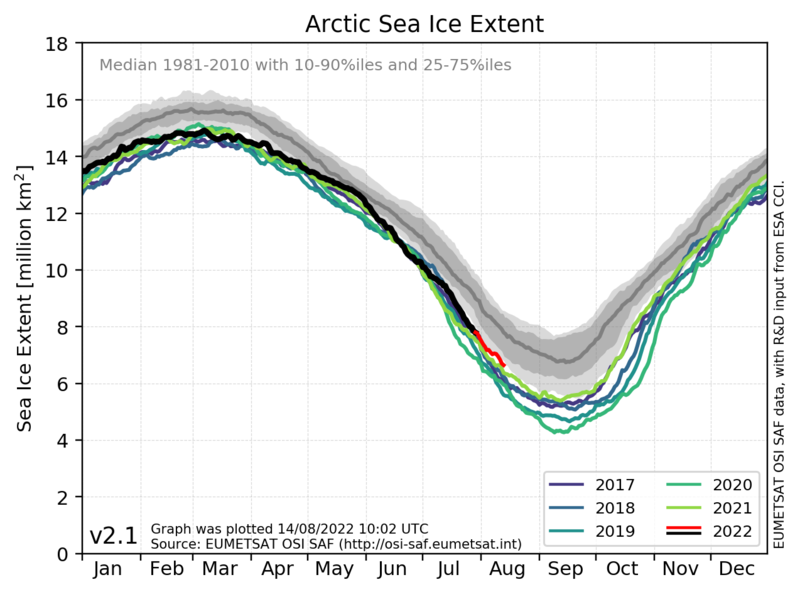 2018 is now in 11th place in recent least ice rankings. This is good news for the Arctic. Let's hope the re-build doesn't stall. Tamarack has done an excellent job combating the global warming fraud alarmists here at LOP. We now have an Arctic Sea Ice Extent back in the "average" area on the Danish Meteorological Institute graph. The average is since recording by satellites has begun in 1979 til now. The Earth has cooled three quarters of a degree Centigrade since the big El Nino in 1915.